Frogs can be large or small, poisonous or not, but they all have some things in common. All are amphibians, which means they spend part of their lives in water and part of their lives on land. Frogs are not born the way mammals are. They start as eggs and go through stages until they turn into adult frogs. Adult frogs lay their eggs in water or on vegetation overhanging water. They choose places such as slow-flowing creeks, ponds or lakes. The male holds the female around the middle, and he fertilizes the eggs as she lays them. Then, depending on the type of frog, the eggs might float freely on the water or the parents might fasten them to underwater plants. They hatch anywhere from six to 21 days later. The tiny creatures that emerge are not yet frogs but are tadpoles, complete with gills and tails. When tadpoles hatch they are very small. As soon as they are free from the egg they attach themselves to plants in the water such as weeds, cattails or grass. They stay there at least a week, eating tiny bits of algae or chewing on the plants. When they’re ready, the tadpoles release themselves from the plants and begin to swim freely, searching out algae, plants and insects to feed upon. Each species of frog has its own timetable for how long it spends in the tadpole stage; it might be a few weeks or as long as two years. One of the most fascinating things about tadpoles is that it’s possible to watch them go through metamorphosis. Day by day they undergo changes, slowly growing legs as they move toward their adult form. As the tadpole grows legs, its tail begins to shrink until it’s just a short stub. During this time it's also developing lungs and slowly losing its gills. When a frog first climbs out of the water it usually still has a bit of tail left, but that’s the only indication that it once swam in the water like a fish. Frogs typically live near water because they must remain wet, and many of them still swim frequently. 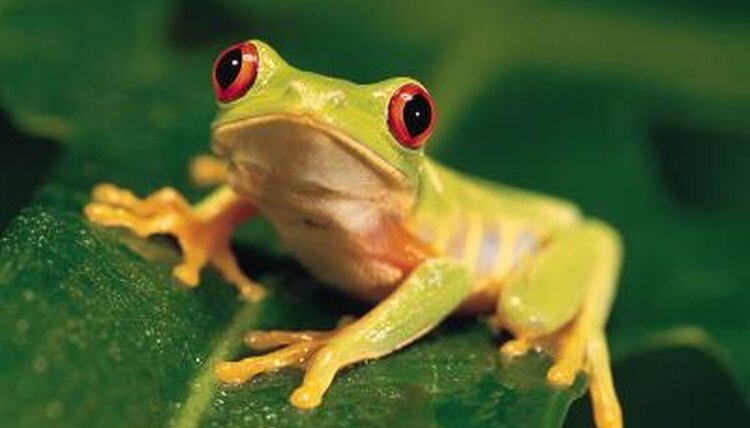 However, adult frogs have turned into air-breathing creatures who can hop or walk on land. As the frog matures it will seek a mate and repeat the egg-laying process that will bring the next generation of tadpoles into the world.